I spent an hour or so, walking around the Forestry Farm Park before work during the week and found a few nice things. Most of the Warblers have headed north now, but I did see a female American Redstart and the usual Yellow Warblers. There were baby Robins and also newly fledged Catbirds just sitting on the grass. From high in the Spruce trees, a lingering Ruby-crowned Kinglet was calling , and a Common Tern gave a few flyby's over the trout pond. Cedar Waxwing - Here is a Cedar Waxwing enjoying a Sea Buckthorn berry from the park that morning. Grrrrrrrrrrrrrrrrr! I would have like to get that one!!!! Stunning shot, one of the most beautiful I've seen recently!! I love these waxings, they are so beautiful... How come you can see one now?? Are they around? Breeding? Thanks Keith and Chris ! This is a shot I'm quite proud of . The light was early morning and there were two Waxwings present at this particular location. They breed here at this time of year, so they are fairly abundant, but not always that easy to find. A stunning shot of a stunning bird I must say! Waxwings are funny birds to photograph - I have had many opportunities, but I have yet to get a photo that I'm please with, that captures the bird. I've got lots of pics that just are quite right. You got a nice one. Hi Nick, I arrived at your site from a google alert on seabuckthorn! What a stunning photo of the cedar waxwing. I do not think I have ever seen a bird photo so beautiful. Do you sell digital versions? 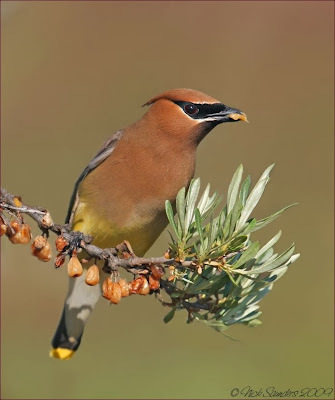 Beautiful photograph of Cedar Waxwing. The brown background compliment the bird colour. Susan, I'd be happy to sell a digital version. Email me for more details. Breathtaking shot Nick. Everything is perfect and the bokeh is stunning. Oh my...this is one of my favorite birds to see..and what a wonderful photo you captured of him. They look like they should be sitting in a painting done on silk and painted by an oriental master!! A quick visit for now. There is an AWARD on my blog for you. Just pop in and pick it up.